The purpose of this blog is to inform people about an illness that many in the medical community discard as unimportant because there is no standard medical treatment for it. Doctors don’t know how to treat it and all patients can do is manage its symptoms. ME/CFS stands for Myalgic Encephalomyelitis or Chronic Fatigue Syndrome. It’s also known as Chronic Fatigue and Immune Dysfunction Syndrome (CFIDS) and Post-Viral Fatigue Syndrome (PVFS). I have had a mild to moderate form of ME/CFS since 2006. When I have a relapse, however, it is severe; I am not very functional and rely on everyone around me to help get me through the very difficult moments. Most of the dreaded symptoms return: severe fatigue, ear and head aches, nausea, lymph node pain, abdominal pain, cognitive impairment, muscle pain, sensitivity to light and noise, dizziness, and more. During my relapse I am in ‘survival mode’ which means all I can do to try to get my strength back is rest. After a few weeks- and sometimes months- I start improving, but it feels like I’ve come out of a train wreck. The experience does not leave me unscathed. I am left traumatized, once again. I’ve tried every kind of therapy to help my body recover but the only thing that seems to really work is to carefully schedule work, personal activities, low-level exercise, and pre-emptive rests. I keep track of everything in a health log, but it’s not an exact science, there are no set rules to follow, and that is why I relapse. Why am I trying to raise awareness for ME/CFS? 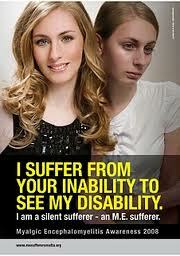 More people need to become aware of this illness, of the suffering it causes. Many have heard of ME/CFS but don’t really understand what it is. In fact, the name Chronic Fatigue Syndrome itself is responsible for many of the misconceptions and trivializations of it. Even though fatigue is a prominent feature of the illness it is a symptom and not the illness. It is difficult to convey the severity of an illness whose name denotes tiredness. Before I got sick I too had heard of Chronic Fatigue Syndrome but never really paid much attention to it probably because it isn’t a terminal illness, like cancer. Many people with ME/CFS have no quality of life and would rather die. Suicide can be an attractive option for ME/CFS sufferers. More and more evidence points to the fact that the illness may be infectious in nature. While the CDC (Centres for Disease Control) has not confirmed most cluster outbreaks, there have been reports of family members in the same household, or multiple people in the same workplace/community developing ME/CFS at the same time. To help people learn to recognize the symptoms of ME/CFS– early diagnosis may prevent the illness from becoming severe. Also, exercise makes the illness significantly worse. So if you suspect that you, or someone you know, might have ME/CFS, stop all exercise and do whatever it takes to get a correct diagnosis. Because ME/CFS sufferers look ‘normal’ most people don’t know how they struggle to stay afloat. It’s important to inform the general public about this serious and disabling illness. What can you do? All you need to do is try to educate at least three people about ME/CFS and the impact it has on daily living. By doing this small thing you can help raise awareness. It’s hard to say how many people you will touch with your story or with the story of someone you know. This entry was posted in Personal, Raising Awareness, What is ME/CFS and tagged CDC, Dr. Nancy Klimas, infectious, ME/CFS. Bookmark the permalink. Well done on trying to raise the awareness of such an unrecognized illness. I care for my girlfriend who has had CFS/ME for 5 years and very severely over the last 18 months. As you can imagine we’ve tried various treatments, and we’ve found it incredibly frustrating how little people know about it, both in the medical world and the general public. I really hope you stick with this, because, as you mentioned, there are so many sufferers of the condition who’ll probably have a really tough time just because people don’t understand. Thanks. And good luck to you and your girlfriend. I will write about different treatment options in one of my upcoming posts. As you may know, what works for one CFS/ME sufferer may not work for another. What’s helped me is the Amygdala Retraining Program in combination with the ‘energy envelope’ and pre-emptive rests.